Get Dependably Great Service from True Experts. Visit the Certified Service experts at your local Lapeer County dealer for vehicle maintenance and repair. 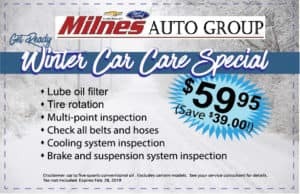 Get great offers on our authentic expertise – including oil changes, brake services, tires, batteries, and more – only available at Milnes Chevrolet. *Disclaimer: up to five quarts conventional oil . Excludes certain models. See your service consultant for details.